Since Ebola’s first symptoms resemble that of the flu, fears about Ebola could drive an influx of patients to doctors and emergency rooms with flu symptoms, who might otherwise have stayed home, doctors say. Each year, the Centers for Disease Control and Prevention estimates that between 5% and 20% of Americans get the flu, though most don’t see their doctor. In 2011, the last year for which data is available, 1,532 Americans died from influenza. That number gives a sense of which disease is more dangerous to the greatest number of Americans. While only three people have been diagnosed with Ebola in the United States, nearly 40 percent of Americans say they are concerned that someone in their family will get the deadly virus within a year, a Harvard Public Health poll found last week. While the media and polls depict an American public that is acutely fearful about Ebola, there is only modest evidence of a widespread change in behavior thus far. That could change as flu season kicks off, especially if new cases of Ebola arise in the United States. “We might expect to see an increase in people seeking health care for influenza like illness this season,” said Dr. Richard Webby, the director of a World Health Organization center studying influenza. But Webby described the flu as “background noise,” for its potential interference in efforts to contain Ebola. For those who do see a doctor, the CDC tracks the percentage of visits in which the patients report flu-like symptoms, regardless of whether he or she actually has the flu. This figure is the best to follow to determine how fears over Ebola are influencing Americans’ response to the flu. Since March of this year, the percentage of flu related visits has been higher than the same period in 2013. This uptick approximately correlates with the rise of Ebola new coverage. Over 200 labs submit specimens tested for flu to CDC’s flu surveillance network. 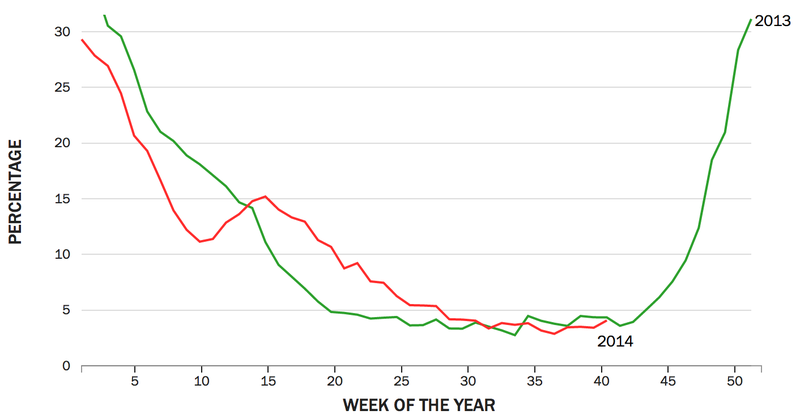 The number of specimens tested each week, graphed below, rises along with the increase in patients with flu symptoms. Fear over Ebola may explain this rise, though the most recent uptick in October marks the beginning of a new flu season, in which CDC added 120 new laboratories. Of course, the severity of the flu varies from year to year, which could also account for any change. Of the specimens tested above, the 2014 strain of the flu outpaced the 2013 version through May, but now appears indistinguishable. With additional reporting by Pratheek Rebala. 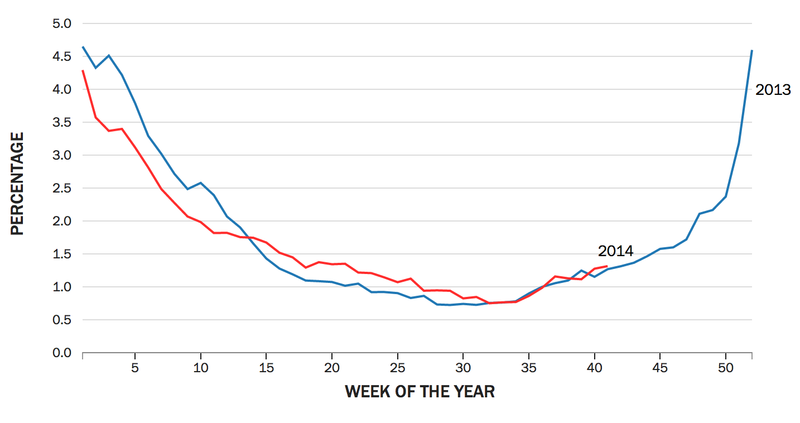 Data from the Centers for Disease Control weekly influenza reports.